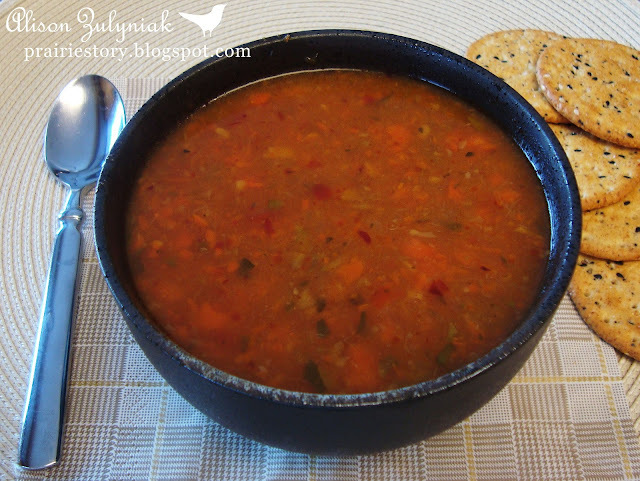 If by chance, your New Year's resolution has anything to do with living healthier, here is a healthy, easy vegetable soup to help! You don't have to be precise with how many vegetables you add.. I usually add whatever amount I have in the fridge! Of course, this is always better made with fresh garden veggies! - In large soup pot, saute onion in olive oil. - Add all the vegetables and stir. Then add tomatoes, mushrooms and top with water. - Add seasonings and simmer for an hour. Adjust seasonings to your taste. - Blend about half of the soup with blender or all of it if you don't want it have chunks. I love simple soups like this! Wish I had some today.